One-thirty one. The best meal / experience / evening I've had in Hong Kong, hands down. I've been dying to try one-thirtyone for the last few years and was even more excited to go after learning that Chef Caith (who was part of the inaugural team at the Krug Room and has worked with the likes of Pierre Gagnaire, Thomas Keller and of course Uwe) has taken the helm. It was quite hard to book a table but we managed to secure reservations Saturday evening about a month in advance. I was a bit scared that my expectations were too high but I had nothing to be worried about. We arrived slightly ahead of schedule and were greeted by a huge doberman and a panting Chef Caith running after it. Luckily, there were gates separating us and the dog but I couldn't help taking a few steps back thinking if it really wanted to, it could break down whatever barrier was in between it and it's prey :P Dog restrained, we were invited to take a stroll around the garden before our table was ready. 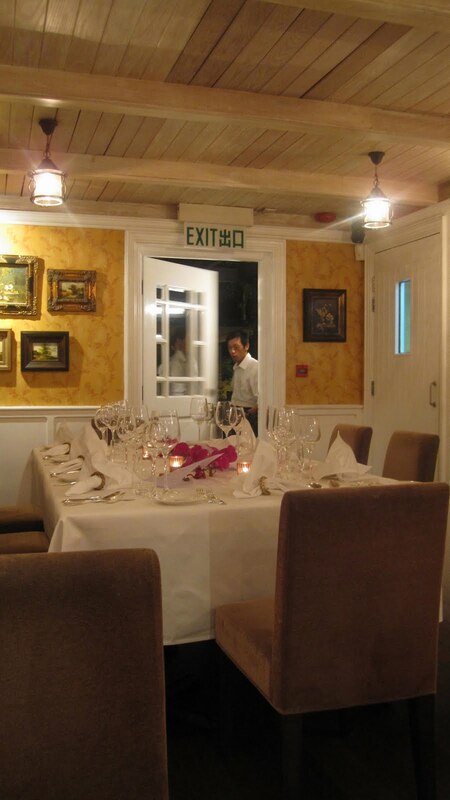 The restaurant is set in a beautiful country house with terraces on each floor. It really felt like you're in the European countryside. They have a big front lawn which apparently can accommodate those who wish to make a grand entrance via helicopter. In front of the lawn is a small beachfront and a private dock. 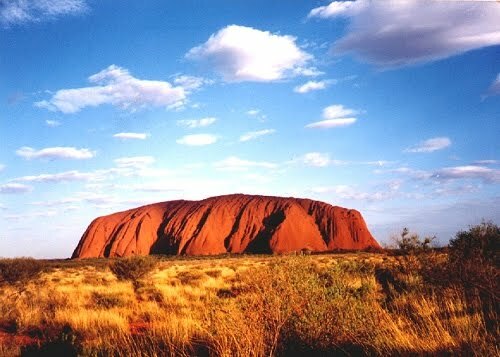 Very picturesque, I'm sure it would be gorgeous in the daytime or if you're here early enough to catch the sunset. The 7-course dinner (no a la carte) sets you back $900 per person which is definitely reasonable given the quality and amount of food served. There's also a wine list though they only have house wine by the glass. Chef Caith changes his menu often and you can give him any dietary restrictions in advance. We were first served warm, freshly baked bread that was absolutely delicious with the olive oil and cranberry balsamic vinegar they provided. The cranberry taste was great and I definitely want to hit up CitySuper and get some for myself! They also had a balsamic vinegar with figs, though we didn't get to try it. Can't remember what exactly this was. Some crispy wafer that tasted almost like shrimp crackers, with a piece of pork (?) on top. Unfortunately, I couldn't really understand the waiter when he explained it. Nevertheless, it was really good and I loved the hot meat on the cool wafer. Luckily, Chef Caith came out to describe all the other dishes and you could definitely tell how enthusiastic he is about cooking and the amount of thought and attention that goes into the construction of each of his plates. He explained that he used orecchiette pasta because it absorbs flavours better, and topped it with a 64 degree slow-poached egg - the perfect temperature for a soft boiled egg. 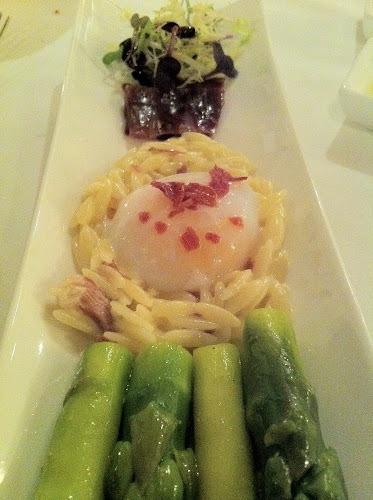 The carbonara was accompanied with slices of iberico ham and asparagus. I was first introduced to challandais duck while living in Paris - I had been told to try it at La Tour D'argent which has been serving this duck since the 19th century and source all of them from Challans. I wonder if one-thirtyone does the same. 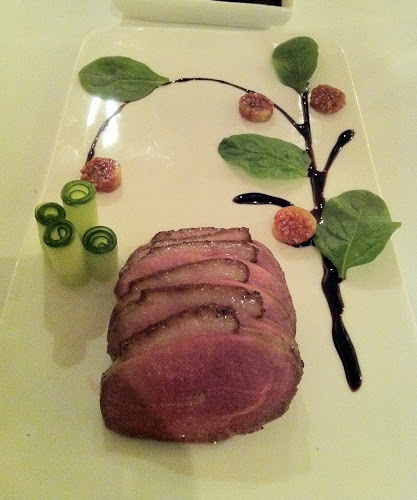 Either way, this duck was stunning dipped in the 25-year old balsamic vinegar on the side and eaten with the figs. Chef Caith told us that the way it was plated was meant to be reminiscent of a tree. It reminded me a lot of the "garden" salad we ate at the Mandarin Grill which is where I suppose Caith draws most of his inspiration from. Unfortunately, he didn't mention that we should wrap it up like a peking duck with the spinach leaves on the side - we only heard this later when he was introducing it to the party of 8. Nevertheless, still delicious and I knew we were in for some great food! Again, this dish was amazing. The broth was really comforting and made me wish someone would make it for me each time I'm sick! 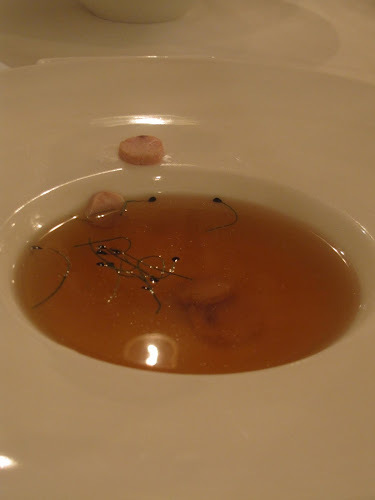 I loved the chicken pieces which were a tiny bit spicy and contrasted beautifully with the clear, lighter broth. I wasn't sure how I felt about the coconut balls though! While they were really interesting texture-wise and it was pretty cool how coconut burst out of them, I thought it was a bit of a weird taste when paired with the soup. Absolutely nothing like what I expected a pizza to be! The dish consisted of baguette wafers, lobster, melted reblechon cheese and parmigiano chips on top. 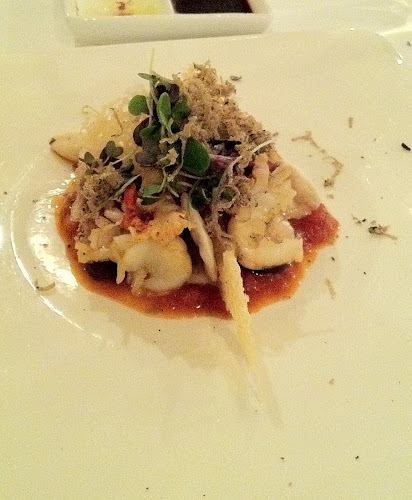 Chef Caith then grated a very generous helping of truffle on top! I loved the messy plating of this dish and thought it looked really fun. The lobster was great with the melted cheese (Caith said he used reblechon because it's much stronger than your typical mozzarella and he was soo right with his call!) and the organic tomato paste was so simple but so good. It's a great testament to the whole meal in general when I say that such a yummy dish was my least favourite of the night! Apparently one time he did this, his iPhone started ringing while he was explaining his concept to the guests! Haha. Slightly embarrassing :P Anyway, Caith said he's never been before but wants to go and was inspired by it to produce the dish we have above! The clouds were my favourite part!! The foam was made out of truffle oil, mashed potatoes and chicken. You could really taste the truffle which works amazing with steak and really brings out the flavour of the meat. I wished I had stolen his little piper because I wanted to squirt it all over my steak! Favourite dish of the meal!!! Wow the prime sirloin was cooked so well and I loved the couscous "sand" at the bottom which was actually made out of cauliflower! The desert was zucchini and there were some long beans at the end to represent the cactus. Quality of meat was great and it was cooked to medium rare perfection. Compare this piece to the one we recently had at Greyhound cafe :P OH and the mushrooms were delicious too! Just such a well-constructed dish that was beautiful to look at and even better to eat. Before the dessert we were given a cheese platter with a selection of soft and hard cheeses. 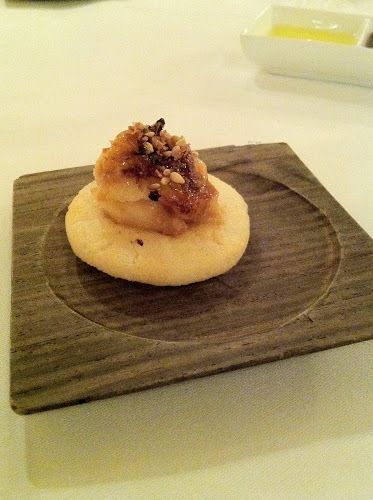 Unfortunately no description here of what we were eating but I did enjoy the brie and the candied walnuts! On the menu, our dessert was described as "lawn. log. mushroom". Haha sounded very unappealing for a dessert but we were so excited when it arrived looking like the above. Super creative and whimsical, it really did feel like our little garden. The mushrooms were made out of vanilla bean ice cream and chocolate mousse, topped with meringues. The lawn was a thin green tea sponge cake, which had salted caramel nuts hiding underneath that was meant to be the soil! The chocolate balls to the side were great - they crackled in your mouth which reminded me of those rocket fizz candies I used to love. And I really enjoyed the green tea sponge cake which was light and airy but had a good green tea flavour to it and worked really well with the vanilla ice cream, salted caramel, and chocolate sprinkles everywhere. So much fun to eat! Everything about this meal was just so right. 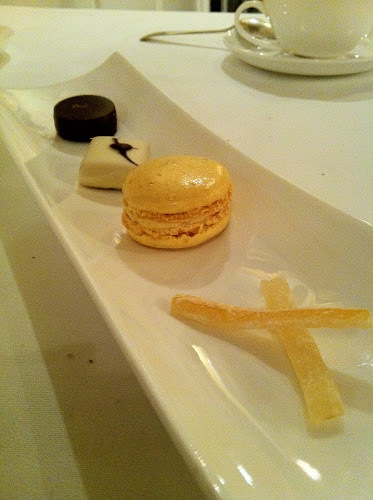 The setting was beautiful, service amazing, and the food truly outstanding. I loved that Chef Caith came out to introduce all the dishes, giving the whole meal a much more personal feel. He also made sure to say goodbye and walk us to our taxi, giving us his personal name card along the way and insisting we come back the following day! I was very very tempted. Definitely the best meal I've had in Hong Kong with beautifully plated food that looks appealing and tastes sensational. I adored it all. Will definitely try to make it back before the end of the year!! (I would recommend catching a cab from Wu Kai Sha station which costs about $20. If you don't want to go through the hassle of changing lines from the New Territories line, a cab from Chinese University station was about $60).